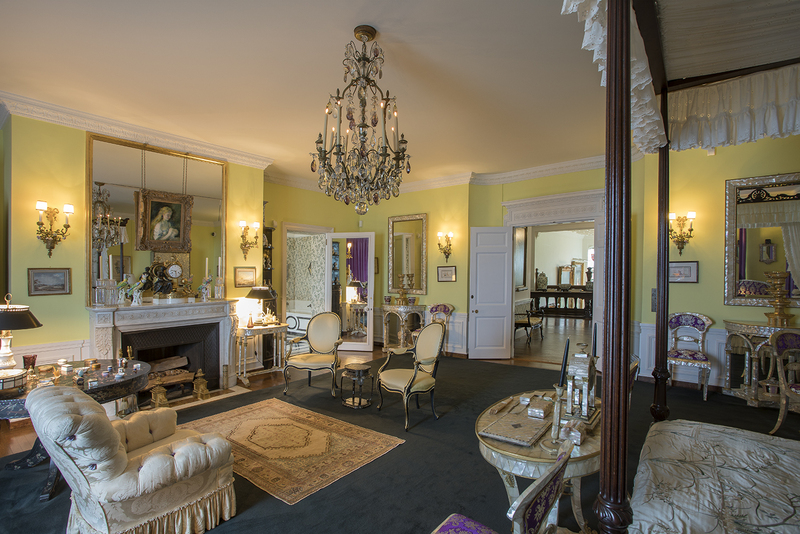 Doris Duke’s bedroom features her deep love for mother of pearl furniture. From the bed to the nightstands, to the seating and tables, the room is a pearlescent dream, with accents of purple, of course! 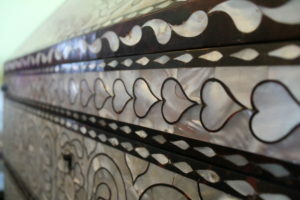 However, the Peruvian mother of pearl desk is especially stunning. The desk features a scalloped pediment above a pair of cabinet doors enclosing shelves. 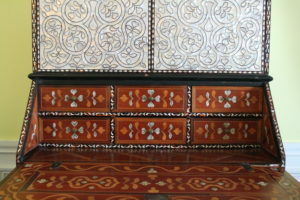 The interior is veneered with stars and parquetry, and above a slant front enclosing, six short drawers are inlaid with ivory hearts. When opening the chest, these little hearts are quite the pleasant surprise! 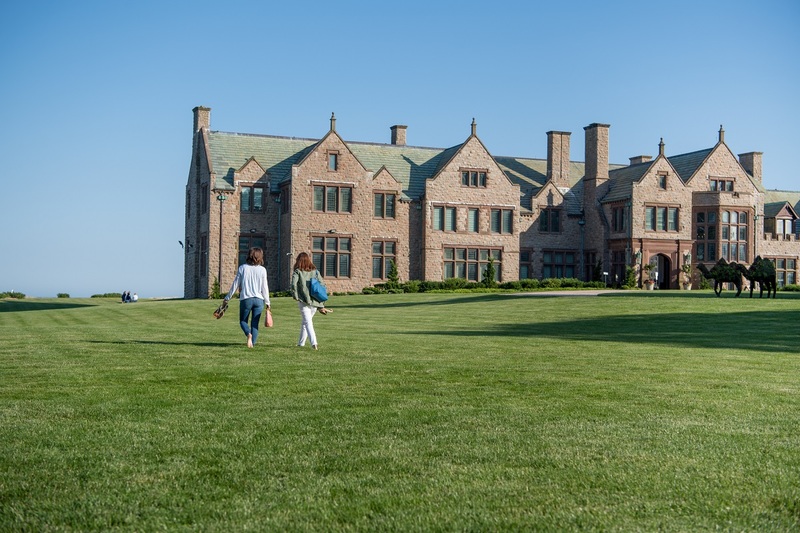 Doris Duke was often the most generous to those closest to her. While we do not know the giver of this gift or the reason for such thanks, we can only guess that Miss Duke extended a kindness to “Paul” in a way that was worthy of such a beautiful thank you. The inscription says, “Doris, you are a truly great friend. Love, Paul”. 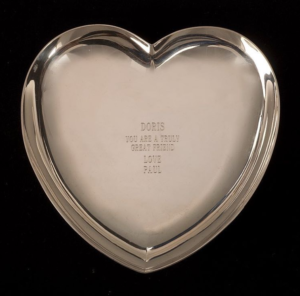 A keepsake of Doris’, this Tiffany & Co. heart shaped dish is stored safely in the collection archives at Rough Point. 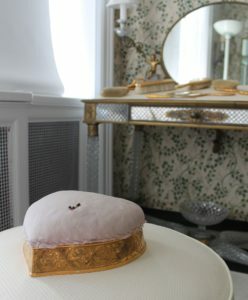 Another Tiffany & Co. piece from the collection, the base of this heart-shaped pincushion is made of 18-karat gold, while the cushion is made of silk with cotton interior stuffing. 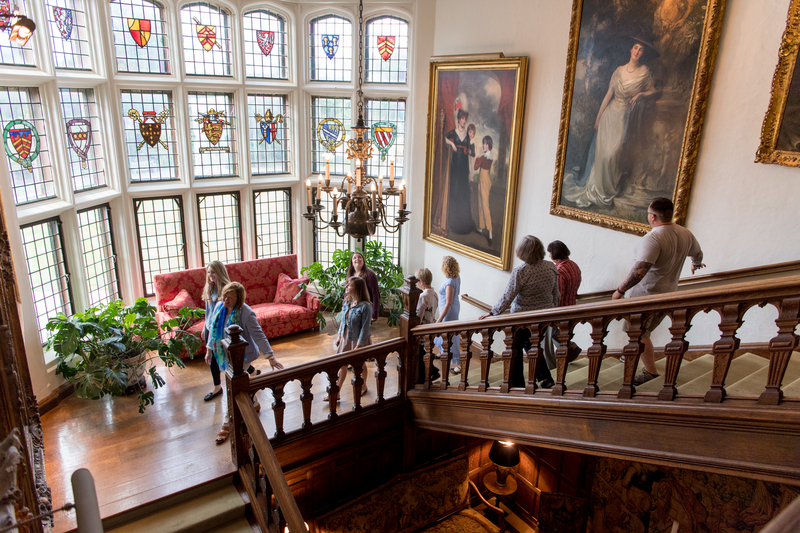 It is part of a 14-piece Tiffany dressing set that once belonged to Doris Duke’s mother, Nanaline. 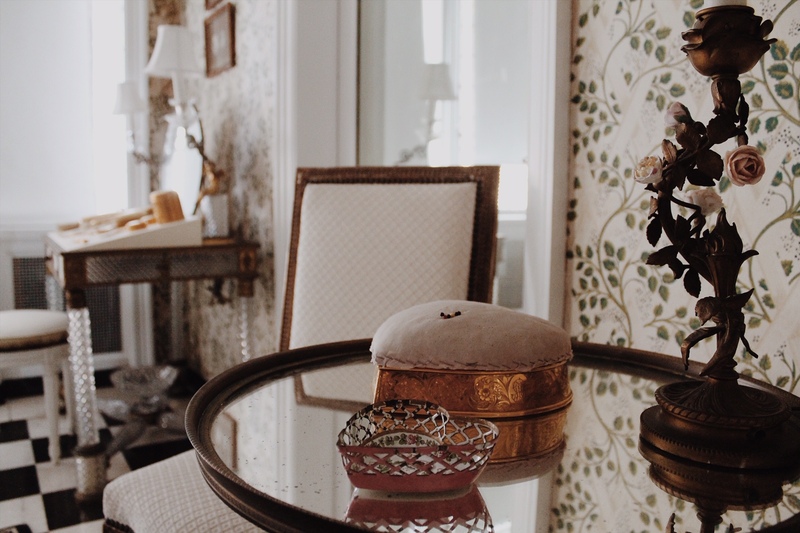 Currently it is located in Doris’ personal bathroom in her bedroom at Rough Point, along with rest of the dressing set. Long live the king! 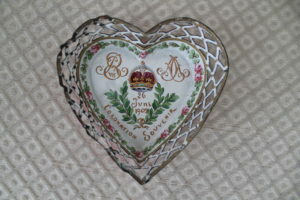 This enamel dish with copper latticework is actually a souvenir from the 1902 coronation of British monarchs King Edward VII and Queen Alexandra. It is unknown where Doris Duke acquired it, but this elegant dish also sits in the bathroom of her bedroom at Rough Point. 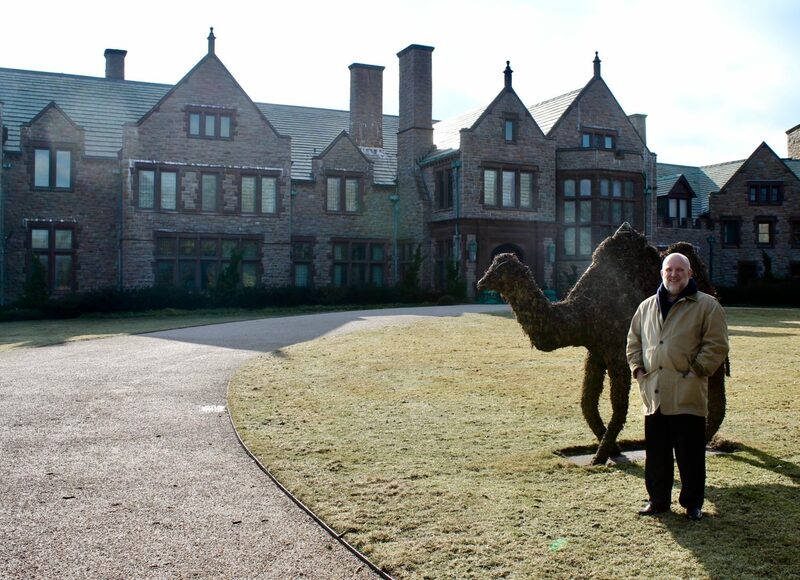 Want to learn more about the collections at Rough Point? Visit newportrestoration.org/roughpoint/collection or find Newport Restoration Foundation at newportalri.org!